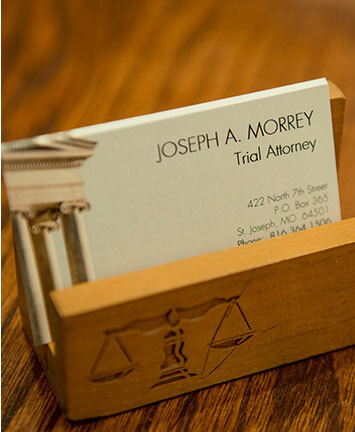 The Law Offices of Joseph A. Morrey has represented numerous clients over the years and won many substantial jury trial verdicts and settlements in many cases. Trial attorney Joseph Morrey represents people in a variety of serious personal injury and death cases. The following is a list of verdicts and settlements he has achieved for his clients. Meyer v. Orlyn Lockard, Jr. M.D. Younger v. Southern. Union Ins. Co. d/b/a Mo. Gas Energy, et al. Joseph A. Morrey can seek the best possible settlement in your case. Call Joe Morrey in St. Joseph at 816-364-1506 for your free case consultation. You can also email Joe to set up your appointment. Why settle for less? In compliance with our Supreme Court Rules of Professional Conduct 4-7.1, we must advise you that past results afford no guarantee of future results and that every case must be judged on its own merits.